Home » Reports » Jacob Report #9–Was There an Alternative to the Holocaust? Jacob Report #9–Was There an Alternative to the Holocaust? On January 20, 1942, at a Nazi retreat and conference center outside Berlin, 15 mid-ranking SS commanders and a variety of German government ministers met together at the request of the ruthless and efficient chief of security, Reinhard Heydrich. It was at this conference on the shore of the peaceful and beautiful Lake Wannsee that the fate of over 6 million Jewish men, women, and children was decided. The policy established at the Wannsee conference would be Hitler’s answer to the “final solution of the Jewish question.” From that day, a strategy which had, to that date, only been encouraged became the official government policy for dealing with the Jewish people. The goal was the complete extermination of the entire Jewish race. Where Was God During the Shoah (Holocaust)? For the Jewish people, this is undoubtedly the most bewildering question in recent generations. Survivors of Hitler’s “Final Solution” were the first to struggle with the question. It is documented that many European Jews who were “religious” in the 1930s emerged from Europe’s ashes grappling with the question. Two answers appeared to develop: 1. God couldn’t do anything to prevent or stop it (and therefore He isn’t worthy to be called God) or 2. He could do something about it and chose not to, in which case He is not compassionate enough to be addressed and respected as God. Many of the previously “religious” European Jews settled upon these two choices and elected to walk away from their faith altogether. What if there is another possibility? What if God not only saw it coming but made an attempt to provide a refuge for the generation of European Jews who would be most impacted? What if the offer of refuge was presented and rejected by the elected representatives of the Jewish people? This Jacob Report #9 will seek to shed light on a much neglected turning point in 20th century Zionist history. It seems that the “prophet” of the Zionist movement, Theodore Herzl, along with certain well positioned Christian British government officials, foresaw what was coming and urgently took steps to provide deliverance for the future victims of Hitler’s ovens. In this Jacob Report we will focus on the question—Was there an alternative to the Holocaust? Theodore Herzl is known as the founder of modern Zionism—the movement amongst the Jewish people to create a Jewish state in Palestine. Herzl was born May 2, 1860, in Budapest. He was educated in Vienna, which was the capital of the Austro-Hungarian Empire during that period. 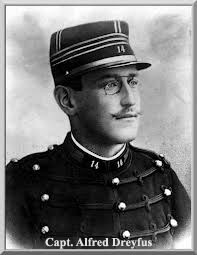 The definitive event which propelled Herzl into history was the 1894–95 trial of the French (Jewish) army officer, Captain Alfred Dreyfus. Herzl was a newspaper correspondent in Paris for the most prestigious newspaper of the Austro-Hungarian Empire, the German language Vienna New Free Press. What occurred in Paris, the capital of the competing French empire, was of significant import in Vienna, thus Herzl’s reports were followed with considerable interest at home in Vienna. The essence of the famous case is that Captain Dreyfus was accused of being the source of classified French documents which were leaked to the Germans. Herzl observed the trial with a certain professional detachment at first, but quickly was drawn into the story. He rapidly became persuaded that Captain Dreyfus was nothing more than a convenient scapegoat for higher-ups. There plainly was no actual evidence against Capt. Dreyfus. The essence of the proof seemed to boil down to the fact that no Jew could be considered a loyal Frenchman and therefore the accused was of course a traitor. Unsurprisingly the “proof” was very disturbing to Herzl, who heard the crowds of interested and vocal French observers shout slurs at Jews everywhere, calling them traitors and foreigners who could never be trusted citizens of France or any other Christian nation for that matter. This was the seminal event in the adult life of Theodore Herzl. This was the moment he became convinced that Jews everywhere and European Jews specifically could never be safe in any country but their own. Therefore, there must be a Jewish nation which would be a safe haven for Jews everywhere—a Jewish nation where being Jewish would never be considered suspect, foreign, disloyal, or outside the mainstream. Although men like Herzl were not religious Jews, it was obvious that the support for the ingathering of millions of Jews from all over the world could logically occur in only one location—the ancient and historic land of Palestine. The Jewish people of the late 19th century were truly scattered throughout the world. They spoke many different languages and reflected the numerous cultures of the nations of their respective exile. They shared the Tenach (the “Old” Testament) and the history of their common origin in the land of Israel known to all at the start of the 20th century as “Palestine.” Wherever there were Jews, every year there was Passover. Wherever Passover was celebrated, the words, “Next year in Jerusalem” were uttered, as if the collective vision of the future reunification of the broken people would not, could not, be forgotten or forsaken. So, from the very beginning, it was clear to Herzl and to the other fathers of this renewed political movement of Zionism that Zion would have to be the focus. In no other place on earth could this disparate people—inhabitants of so many nations—unite in purpose and agreement but in the land of Palestine. Thus, the tiny area of the Middle East became the focus of the Zionist movement. For Herzl and the other leaders of the movement, it wasn’t a matter of religion—it was a purely practical decision. Thus, in 1897 the first Zionist Congress was held in Basel, Switzerland. Jewish representatives from around the world, as well as a handful of “Zionist” Christians, met and agreed upon the need for a modern Jewish nation in the historic land of Palestine, a place where Jews throughout the world could be welcomed as Jews—to live, work, and worship as Jews. In his capacity as the first elected president of the Jewish Congress, Herzl met with Europe’s leaders and want-to-be leaders. A lesser man would have recognized the obstacles as insurmountable. First, there was the land of Palestine itself. For over four centuries, it had been part of the Moslem Ottoman Empire controlled by the Sultan from Istanbul, Turkey, the capital of his empire. Herzl met with the Sultan and attempted all manner and methods of inducement, including bribery, to persuade this Moslem leader to open up a small portion of his great empire to the Jewish people. The Sultan listened with a somewhat bemused interest, but could not be swayed. Second, there was overt hostility throughout Europe to anything that encouraged the Jews to retain their distinctive differences. Giving them their own country was not a priority for any of the politicians of the day. Overt anti-Semitism was widespread throughout Europe and England, especially in heavily Catholic France. In some countries such as czarist Russia, anti-Semitism was actually policy—a political tool like many other tools deployed to divert, distract, and redirect the illiterate, superstitious, peasant masses. A third obstacle to the Zionist vision of a modern Jewish homeland in Palestine was, in some ways, potentially the most disheartening. It was to be found in every Jewish population center of Europe and England, and even in the USA. This was the voice of successful Jews who opposed any deviation from the status quo: their status quo. Herzl called them “the assimilationists.” These particular, mostly Western, Jews had found individual political and or financial success, in many cases overcoming great personal opposition. Nevertheless they had made it and were greatly alarmed; convinced a Jewish nation would be seen as a threat to their own loyalty. Their arguments against Zionism were passionate, even persuasive. They had made it. They were proof it was possible to succeed in spite of widespread anti-Semitism. In the event of a Jewish nation, their own loyalties to their adopted homelands could be called into question. They might even be expected or asked to leave and to return to this foreign, but Jewish, homeland. Unfortunately, these assimilationists were everywhere in positions of influence, both inside and outside of the Jewish community. For this reason they resisted and sometimes ignored the needs of their more persecuted brethren. The voice of the assimilationists in combination with the overt anti-Semites produced a potent and nearly insurmountable force of opposition. The assimilationists gave proof that Jews didn’t need nor desire a homeland, providing all the justification required by the anti-Semites to oppose the relief of the Zionism Herzl offered. The Sultan had recently made it clear there would never be permission granted for a massive Jewish immigration into the Moslem Ottoman Empire, especially the requested area of interest—Palestine. A politically weak and inexperienced Czar Nicholas was under increasing pressure for political reform, if not revolution, by his peasant subjects. The millions of Jews who lived in the pale of his empire were a particular problem. For centuries the czarist rule was absolute and unquestioned. The divine right was the linchpin of the “Fundamental Laws,” the centerpiece of all Russian law during the rule of the czars. However, the revolutionaries wished to see the end of civilization as expressed by the fundamental laws. The revolutionary organizations were, on too many occasions, populated by Jews, at least it seemed so to the Czar and his administration. Although the Jews were less than 3% of the Russian empire’s population, they made up to one-third of the revolutionaries. The more the czarist armies repressed the peasants and the Jews, the more the revolutionaries responded with retaliation and assassination of his officials, even the Czar’s own family. Czar Nicholas’ grandfather, Alexander II, had been the victim of an assassination by a group of these revolutionaries. Anti-Semitism had developed as a vital and integral instrument of state policy. Russia had been philosophically anti-Semitic for centuries. However, in reality, few Jews actually lived in mother Russia. That changed during the period of 18th century when immense areas of Eastern Europe came under the “protection” of the czarist Russian Empire. With these vast newly conquered lands of Eastern Europe which included Poland also came millions of Jews. Thus, the initial laws were designed to protect the heartland of Russia from being polluted by the Jews. The Jews were not allowed to venture beyond the pale, that is, to enter the heartland of Russia outside the areas of the eastern European provinces of the czarist empire. To venture “beyond the pale” was to invite severe reprisals from the czarist legal system, including a possible death sentence. Other necessary laws prohibited “too many” Jews from receiving higher education, thus protecting the Christian population from being exploited by the Jews. Organized anti-Semitic demonstrations were not only tolerated but encouraged. In czarist Russia, it was taken for granted the peasants were going to complain. The Jews proved useful as an instrument and object of focus for the malcontents to express their displeasure harmlessly. Better the hostilities were exhibited toward the Jewish foreigners than against the Czar’s government officials. Czarist government organized expressions of Christian outrage toward the Jewish invaders came to a head during the Easter holiday of 1903 in the village of Kishinev, a diverse community with an almost 50% Jewish population. Prior to Easter Sunday, word had been circulated that a government endorsed expression of Christian outrage would commence against the Jewish exploiters of the peasant Christians, beginning on Easter Sunday 1903. Over a period of three days, the masses of the czarist subjects lashed out at the Jewish community, killing, burning, and destroying. All of this was done while the czarist police restrained themselves. Subsequent investigation suggested key police officials helped organize the “spontaneous” Christian riots. Thousands of Jewish citizens were severely beaten and permanently injured. Dozens were bludgeoned savagely to death. Kishinev was the watershed event for Herzl. In the months leading up to the Easter riots in Kishinev, Theodore Herzl visited officials of the government of England at his Majesty’s Government’s invitation. Key individuals of the elected government of England were becoming increasingly alarmed over the growing expression of hostility toward the Jewish people. Within the British government there were, at that time, a number of committed Bible reading and believing Christians who were convinced it was sound Christianity to assist the brethren of their Messiah by providing aid and comfort to the Jewish people. Thus, these prominent government officials felt compelled to assist Herzl in his mission, a mission which they were persuaded was biblical and therefore God ordained. They were also aware, as Herzl had become convinced that the doors of Palestine were solidly shut to large-scale immigration of the Jewish people as long as the Sultan and Islam controlled the historic land of Palestine. The convergence of these factors—an increasing sense of urgency as a result of growing European anti-Jewish expression plus the closed door to Palestine—led to some outside the box, truly creative thinking. It was with these events and conditions in mind that a few well-positioned British officials came up with a suggestion for an interim solution: the settlement and development of a large portion of the British controlled East Africa. This would become known as the “Uganda” proposal. The British East Africa protectorate was administered by the British Foreign Office, but development was stagnant due to a lack of European settlers. After his visit to the protectorate in December 1902, British colonial secretary Joseph Chamberlain conceived of the idea of offering it to the Jews. Although the proposal became known as the “Uganda” proposal, none of the land in question was actually in Uganda. The territory offered stretched from the east coast of Lake Victoria to the Indian Ocean on the east coast of Africa. Today the area is known as Kenya. The name “Uganda” came from the Uganda Railroad which connected the vast territory of British East Africa and was the only notable landmark of modern British civilization. The Uganda Railway was the principle means of travel from the Indian Ocean coast inland. These British officials initially offered the paperwork surrendering control of the lands to the Zionist Congress. Herzl, however, anticipated the potential opposition which might welcome such an apparent deviation in purpose and direction of the organization. He suggested perhaps the lands should be placed in his name personally. Legal opinion was sought by the British government and Council pointed out that Herzl, as a non-British citizen, would be ineligible to be named in such a bequest. This left only the possibility of placing lands in the name of the Zionist Congress. Herzl realized this was problematic, since the Congress had yet to be “consulted” on this potentially “new” direction. It was finally agreed that everything but filling in the name of the assignee would be accomplished prior to the meeting of the Congress, thus awaiting only the approval of the congressional delegates to finalize the arrangement. Following the Kishinev riots, Herzl felt compelled to visit the areas of the pale of Russia in order to see for himself the conditions of the Russian Jewish population prior to the upcoming Sixth Zionist Congress. Seeing the plight of these pathetic Jewish masses crying out to him as though he were their promised deliverer, their long awaited Messiah, stirred in him the realization that action must be taken immediately and without delay. It was this deeply held conviction that led Herzl to take a drastic step. He inquired as to whether the Czar’s Minister of Interior, Konstantin von Plehve, would be willing to receive him to discuss the situation of the Russian Jews. Von Plehve was a man most of Russia’s Jews held in the highest contempt as the government official responsible for forming and administrating the Czar’s national policy of suppression and persecution of the Jewish people, including Kishinev. After first consulting with the Czar, Minister von Plehve stated he was delighted to meet with Herzl. Herzl certainly appreciated that no land, Palestine or anywhere else, could be acceptable if the largest concentration of the Jewish population was not free to emigrate from where they were to the new Jewish homeland. Herzl’s primary mission in the meeting with von Plehve was to grease the wheels for the departure of millions of Russia’s East European Jews. Up to that time, one’s and two’s had departed from a village here and there, but Herzl desired to see a day when entire villages, whole communities, would up and go! No such vast movement of hundreds of thousands if not millions of Jews could possibly take place under the eyes of the czarist armies unless by prior agreement. This was the driving motivation for his private meeting with the Czar’s Minister of Interior. Von Plehve stated, in behalf of the czarist government, that they would support the emigration of millions of Jews provided they would agree to leave and not return. Furthermore, von Plehve was willing to put into writing this understanding and authorized Herzl to present it at the upcoming Sixth Zionist Congress, a meeting of which von Plehve was very well informed. All efforts to pry open the doors of Palestine for substantial legal Jewish immigration had been met with stone cold resistance by the governing authority of the Ottoman Empire, an Islamic government with its capital in Istanbul, Turkey. The controlling figure of this government was the Sultan who was unyielding in his opposition to the idea of significant Jewish Zionist immigration. The elected government of the British Empire was a revolving door of new faces. As the Sixth Zionist Congress was due to be convened, a significant number of biblically persuaded Christians served in key positions and thus held decision-making authority. These Christian officials were more than favorably disposed to the vision of Zionism (i.e., a modern Jewish state). They were aware and stirred to action by genuine compassion over the rise of anti-Semitism on the European continent. They were particularly concerned regarding the situation in Russia where the Czar’s government controlled the fates of multiple millions of Jewish lives in the pale of Russia (i.e., Eastern Europe including Poland). A third factor was the clearly growing virulent and dangerous strands of anti-Semitism which Herzl feared could erupt and sweep over all of Europe as a plague. The recent events of Kishinev and his subsequent visit to the pale of Russia reinforced Herzl’s alarm, leaving him with an eerie sense of foreboding which even tormented his sleep. Finally, his meeting with the Interior Minister von Plehve. The official representative of the Czar’s government, speaking not as a minister (which could be replaced at the Czar’s discretion) but in behalf of the Czar, had provided personal reassurance in behalf of the Czar that the Czar would welcome the departure of millions of Jews from his kingdom. The only condition was that the Jewish emigrants did not have the right to return to Russia; certainly not a problem in Herzl’s calculations. The fact that he was able to leave with a letter of commitment from von Plehve was interpreted by Herzl as a major hurdle removed toward the deliverance of these pathetic masses of impoverished and persecuted Jewish peasants. These were the circumstances and factors which led up to the opening of the historic Sixth Zionist Congress, sometimes known as the Ugandan Congress. The first Zionist Congress at Basel, Switzerland (August 29-31, 1897) had been attended by “whosoever will.” However, it was decided at that first Congress that only elected delegates would attend future Congresses. These individuals were elected as delegates by Jewish communities from around the World. Those elected to serve were the pillars of their villages, towns, communities, and countries. When the Sixth Zionist Congress met, it was attended by delegates who were, therefore, elected representatives of the various Jewish communities and population centers from which they had been sent. There were basically two camps which gave voice to the core of this conflict. The first was that of Herzl and his “proposal” that the Congress consider the British offer of an interim solution to the immediate needs of the Jewish masses. Britain was offering a generous, large area of undeveloped but fertile land which was well endowed with water and lots of “potential.” The British offered this to Herzl and the Jewish Congress as an “interim” homeland where the Jewish people could live, work, and become educated as Jews without interference. There would be “Jewish rule,” not imposed “foreign” rule. Therefore, Jews would be free to create a nation open to Jews everywhere, without limitation, administered and maintained by Jews with Jewish law. The Herzl camp was mindful of the urgent need of the suffering Jewish masses whose plight was becoming increasingly desperate. The “outbreak” of the clearly government organized and endorsed attacks upon peaceful Jewish residents in czarist Russia, as experienced in the recent Kishinev attacks, cast a serious cloud over all European Jews. Herzl’s opinion was that the needs of the vulnerable European Jewish masses required immediate, even drastic, remedy. Though Palestine was the ultimate goal, it was temporarily at least beyond reach. An interim solution had been offered, and Herzl believed circumstances required it be seriously considered. The Zionist Congress was the first worldwide elected delegation of the Jewish people in almost 2,000 years. Herzl felt it was “appropriate” to present the “alternative, interim, and immediate” solution which was being offered by the British government as an option. As he expressed in his diary, this was a “no lose” proposition. The second and dissenting camp was primarily given voice, oddly enough, by the elected Russian delegates. They vociferously maintained that the single and sole purpose of the Zionist Congress was to pursue a legal Jewish homeland in Palestine, and only Palestine. The very name “Zionist” from Zion, the hills surrounding Jerusalem, gave the movement its name and its purpose. Any “deviation” was a betrayal of the hopes and dreams of the Jewish people. “Temporary” needs, no matter how urgent, did not warrant a change in direction. In a nutshell, the Zionist movement was not a Jewish relief organization. There had always been needs amongst the Jewish people and there always would be so long as Jews did not have their own country in Palestine. The needs of the Jewish people, no matter how pressing, were neither the problem nor the purpose of the Zionist Congress. This was not why they were elected as delegates. Now that we have provided a brief background to the dispute, it is very helpful to examine the first-hand account of Chaim Weizmann, one of the elected Russian delegates, as he recorded in his autobiography. Chaim Weizmann was born November 27, 1874, in the village of Motal near Pinsk in Belarus (at that time part of the Russian Empire). As a result of Russian laws that greatly limited higher education for Jews, like many of his Russian Jewish peers, Weizmann traveled to Germany and later Switzerland in order to become educated as a chemist. He is most noted for his Zionist political activities in Britain which led to the Balfour Declaration. The Balfour Declaration was issued by Britain November 2, 1917, a year before the Armistice which concluded WWI. Following WWII and the end of the British Mandate in Palestine in 1949, Chaim Weizmann became the first President of Israel. His autobiography “Trial and Error” was published in 1949 and is a must read for anyone truly interested in the history and origins of the 20th century modern state of Israel. 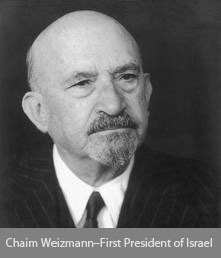 Chaim Weizmann was an elected delegate to the “Ugandan Congress” from his Russian community. It is a basic principle of a historian that you can sometimes derive more information from an opponent or enemy than from a proponent. This is because the reporter who is negative makes no attempt to “cover up” or hide the flaws of the object of his contempt, whereas a proponent frequently hides the imperfections and defects, seeking the “best light” for the object of his affections. It is with this in mind that Weizmann’s account of the Sixth Zionist Congress and his observations of Herzl are presented here. Needless to say, Weizmann and Herzl were at opposite poles of the Uganda dispute. The disagreement proved so divisive that it came close to permanently splitting the Zionist movement. The following excerpt is from Trial and Error—The Autobiography of Chaim Weizmann, © 1949, Harper and Brothers, New York. This is his direct, personal record of the Sixth Zionist Congress, the Ugandan Congress, as recorded on pages 82–88 of the first edition. The calamities of Russian Jewry overwhelmed him; he (Herzl) fore saw the new tides of immigration which Kishinev and its aftermath would set in motion, and he redoubled his efforts for “the quick solution.” As the summer approached we heard vague rumors of political negotiations with England; but we did not learn of their character until the Congress met. Meanwhile another facet of Herzl’s far-flung activities was made public. Herzl had managed to arrange an interview, in St. Petersburg, with von Plehve, the man whose hands were stained with the blood of thousands of Jewish victims! And in the early part of August, shortly before the opening of the Congress, Herzl actually came to Russia to be received by the butcher of Kishinev. There was a passionate division of opinion on this step. There were some who believed that the Jewish leader could not pick and choose his contacts, but had to negotiate even with a murderer if some practical good would come of it. Others could not tolerate the thought of this final humiliation. But there were still others-I was among them-who believed that the step was not only humiliating, but utterly pointless. von Plehve, who had passed a series of decrees, shortly after the Kishinev pogrom, designed to render impossible any sort of Zionist activity, would not make any promises worth the recording; if he did, he would not keep them. It turned out that Herzl not only hoped to influence von Plehve to suppress the activities of the Black Hundreds (it was an utterly fantastic hope since anti-Semitism was a necessary instrument of policy to von Plehve, to Pobiedonostsev, the Procurator of the Holy Synod, and to the whole czarist clique) he even dreamed of enlisting Russian aid in persuading Abdul Hamid, the feeble ruler of Turkey, to open the gates of Palestine to us. Unreality could go no further; anti-Semites are incapable of aiding in the creation of a Jewish homeland; their attitude forbids them to do anything which might really help the Jewish people. Pogroms, yes; repressions, yes; emigration, yes; but nothing that might be conducive to the freedom of the Jews. Such was the fathomless despair of masses of Russian Jews that Herzl’s progress through the Jewish communities took on an almost Messianic aspect. In Vilna, especially, there was a tremendous outpouring of the Jewish population, and a great surge of blind hope, baseless, elemental, instinctive and hysterical, attended his arrival. Worse was to follow at the Sixth Congress. It opened under the shadow of the Kishinev pogrom and Herzl’s visit to von Plehve; it closed with the Uganda episode. The flurry of rumors regarding Herzl’s negotiations with the British Government was put to rest only when the facts were submitted to the Congress. Before making these facts public, Herzl had already consulted the Actions Committee-the cabinet-of the Congress, and had discovered that he would encounter strong opposition. How strong he was yet to learn. There was, among many of the Russian delegates, a deep resentment against Herzl in connection with his visit to von Plehve. This repressed resentment was fortified when, having set the stage with his customary skill, Herzl read forth the famous letter from the British Government, signed by Lord Lansdowne, offering the Jews an autonomous territory in Uganda, in that part of it which is now British East Africa. I remember one deeply significant detail of the stage setting. It had always been the custom to hang on the wall, immediately behind the President’s chair, a map of Palestine. This had been replaced by a rough map of the Uganda protectorate, and the symbolic action got us on the quick, and filled us with foreboding. Herzl opened his address with a vivid picture of the situation of the Jews, which we, the Russian Jews, knew only too well. He deduced from it only one thing: the urgent necessity of bringing immediate, large-scale relief by emigration to the stricken people. Emergency measures were needed. He did not relinquish the idea of Palestine as the Jewish homeland. On the contrary, he intimated that von Plehve’s promises to bring Russian pressure to bear on Turkey had improved our prospects in Palestine. But as far as the immediate problem was concerned. something new, something of great Significance, had developed. The British Government had made us the offer of a territory in British East Africa. Admittedly British East Africa was not Zion, and never would be. It was only an auxiliary activity-but on a national or state foundation. It was an extraordinary speech, carefully prepared-too carefully in fact, for its cautious, balanced paragraphs betrayed the essential contradictions of the situation. Herzl had already encountered deep opposition in the closed session of the Actions Committee. But he had obtained a majority, and had enforced the unit rule, so that he could present the British offer in the name of the Actions Committee. Knowing, then, that he would encounter similar opposition on the floor of Congress, he did not submit the proposition that the British offer be accepted; he cushioned the proposal by suggesting that the Congress send a commission of investigation to the territory in question, to report on its suitability. The effect on the Congress was a curious one. The delegates were electrified by the news. This was the first time in the exilic history of Jewry that a great government had officially negotiated with the elected representatives of the Jewish people. The identity, the legal personality of the Jewish people, had been re-established. So much, then, had been achieved by our movement; and it meant much. But as soon as the substance of the offer, and Herzl’s manner of announcing it, sank home, a spirit of disquiet, dejection and anxiety spread through the Congress. It was clear that Herzl’s faith in von Plehve’s support of our hopes in Palestine was more or less put on. And again, it was all very well to talk of Uganda as an auxiliary and a temporary measure, but the deflection of our energies to a purely relief effort would mean, whatever Herzl’s intentions were, the practical dismantling of the Zionist Organization in so far as it had to do with Zion. How was it that Herzl could contemplate such a shift of objective? It was the logical consequence of his conception of Zionism and of the role which the movement had to play in the life of the Jews. To him, and to many with him-perhaps the majority of the representatives of the Jews assembled in Basle-Zionism meant an immediate solution of the problems besetting their sorely tried people. If it was not that, it was nothing at all. The conception was at once crude, naive and generous. There is no immediate solution of great historic problems. There is only movement in the direction of the solution. Herzl, the leader, had set out with the contrary belief; and he met with disappointment. The Judennot -the Jewish need-was increasing hourly. Herzl had been in Russia and had cast a shuddering glance at the Pale and its miseries. Everywhere he had been received by a desperate people as its redeemer; it was his duty now to redeem. If Palestine was not, at the moment, feasible, he could not wait, for the flood of anti-Semitism was rising minute by minute and-to use his own words-“the lower strata of the Jewish edifice were already inundated.” If anything were to happen, then, there might not be enough Jews left to build Palestine; hence the offer of the British Government was providential; it had come just in the nick of time-a very present help in time of trouble. It would be cruel, heartless, un-Jewish and un-Zionistic, to throwaway a chance which might never again occur in the history of the Jewish people. Herzl’s statement to the Congress was cautious, dignified and guarded; off stage, in the lobbies of the Congress, he was less diplomatic, more human, more vehement. He, and those under his influence, little thought that what he was offering to Jews and Zionists was a snare and a delusion: there was no territorial project, however magnificent it might appear at first blush, which could possibly, within a short space of time, have relieved the tension and appreciably mitigated the disasters which had come upon us with the force of an avalanche. Jewish emigration from Russia, which before Kishinev had been rising steadily, reached the figure of one hundred thousand per annum after Kishinev. In any case, the proposal before the Congress was only that of an investigation committee. But no one was mistaken as to the symbolic significance of that proposal. A deep, painful and passionate division manifested itself on the floor of the Congress. When the first session was suspended, and the delegates scattered in the lobbies, or hastened to their caucuses, a young woman ran up on the platform, and with a vehement gesture tore down the map of Uganda which had been suspended there in place of the usual map of Zion. All of these arguments, it seemed to me, were informed by a curious inferiority complex. In the session of the Russian delegation, I made a violent speech against the Uganda project, and swung to our side many of the hesitant. In the confusion of the offer, which Herzl had flung so dramatically at the Congress, many of the delegates had lost their bearings. I myself, I admitted, had for a moment looked upon the incident as a party maneuver but it had become clear to me that it was much more fundamental. It was an attempt to give a totally new character to the Zionist movement. The very fact, I said, that the Mizrachi-the religious Zionists-were mostly for Uganda, and the Democratic Fraction mostly against it, revealed the nature of the move. “The influence of Herzl on the people is very great,” I said. “Even the opponents of Uganda cannot get away from it, and they cannot make up their minds to state openly that this is a departure from the Basle program. Herzl, who found the Chibath Zion movement already in existence, made a pact with it. But as time passed, and the idea of Palestine did not succeed, he regretted the pact. He reckoned only with external conditions, whereas the forces on which we base ourselves lie deep in the psychology of our people and in its living impulses. We knew that Palestine could not be obtained in short order, and that is why we do not despair if this or that particular attempt fails.” And I closed my speech with these words: “If the British Government and people are what I think they are, they will make us a better offer.” This last sentence became a sort of slogan for the anti-Ugandists at the Congress. The debate on the Uganda proposal had opened at the first session of the Plenum with a speech in the affirmative by Max Nordau. It was not a convincing speech, for Nordau himself was not thoroughly convinced, and had yielded only to pressure. It was then that he coined the famous phrase Nachtasyl-night shelter; Uganda was to be colonized, nationally, as a sort of halfway station to Palestine. As the debate unfolded, the first flush of excitement over the recognition of the Zionist Organization by a great government died away. The feeling against the proposal began to crystallize. The debate was resumed after the separate sessions of the caucuses, and was closed by a second address from Nordau. The Congress was in a high state of tension. Family bonds and lifelong friendships were shattered. The vote on the resolution was by roll call. Every delegate had to say “Yes” or “No.” The replies fell, in a deathly silence, like hammer blows. We felt that the destiny of the Zionist movement was being decided. Two hundred and ninety-five delegates voted “Yes,” one hundred and seventy-five “No.” About a hundred abstained. A young lady, the one who had torn down the map of Uganda from the wall behind the dais, happened to be standing by. She exclaimed, vehemently: “Monsieur le President, vous etes un traitre!” (“Mr. President, You are a traitor!”) Herzl turned on his heel. Technically, Herzl had a majority for the Uganda proposal, but it was quite clear that acceptance of the British offer would be futile. The vote had been too close. Besides, the people for whom British East Africa was to be accepted, the suffering, oppressed Russians, did not want it. They would not relinquish Zion. ‘When the result of the roll call was announced in the Plenum the Russian members of the Actions Committee who had been against the proposal at the closed session compelled Herzl to exonerate them from responsibility for the unit vote. They then left the dais and marched out from the hall, followed by the great majority of the Russian delegates. It was an unforgettable scene. Tschlenow, Kornberg and others of the older statesmen wept openly. When the dissidents had assembled separately, there were some delegates who, in the extremity of their distress, sat down on the floor in the traditional ritual mourning which is observed for the dead, or in commemoration of the destruction of the temple on the ninth of Ab. I remember that not long afterward Achad Ha-am wrote an article “Ha-Bochim” (“The Weepers”), in which he mournfully recalled his consistent criticism of the lack of folk Zionism in the Western leaders; this defection from Palestine, he declared, had been implicit in the Western leadership from the beginning; it had first declared itself in Herzl’s Judenstaat, in which Zion had not even been mentioned; then in his Altneuland, his Utopian novel which had described a Jewish homeland of the future without a Jewish culture; and now came the denouement, the substitution of a remote, unknown African territory for the glory of the historic Jewish homeland. Meanwhile, as we sat in caucus, depressed, our hearts filled with bitterness, a message was brought in that Herzl would like to speak to us. We sent back word that we would be glad to hear him. He came in, looking haggard and exhausted. He was received in dead silence; nobody rose from his seat to greet him, nobody applauded when he ended. He admonished us for having left the hall; he understood, he said, that this was merely a spontaneous demonstration and not a secession; he invited us to return. He reassured us of his unswerving devotion to Palestine, and spoke again of the urgent need for finding an immediate refuge for large masses of homeless Jews. We listened in silence; no one attempted to reply. It was probably the only time that Herzl was thus received at any Zionist gathering; he, the idol of all Zionists. He left as he had entered; but I think that at this small meeting he realized for the first time the depth of the passion which linked us with Zion. This was the last time that I saw him except from a distance, on the platform. He died in the following year, at the age of forty-four. The sixth Congress, with its dramatic focalization of the Jewish problem, taught me much. In particular, two of the issues there presented illustrated the principle of organic growth in which I have always believed. Nothing good is produced by panic. It was panic that moved Herzl to accept the Uganda offer uncritically. Why Was Hitler So Effective? Let us assume Hitler was destined to come to power in Germany. He seethed with rage against the Jews and coveted their success—their businesses and property. Did 6 million have to die? Why was this program of Jewish annihilation so completely and thoroughly effective? The initial policy of Hitler’s government was to “encourage” emigration. This was done through a process of increasingly severe anti-Jewish laws, such as the Nuremberg laws. In 1939, a boatload of refugee Jews sailed from Germany for Cuba on the St. Louis. Cuba was one of the last “open doors” for such refugees. Before the St. Louis arrived, Cuba “revised” its open-door policy and only a handful of the wealthiest were allowed to disembark. Terror struck the hearts of the remaining passengers as they considered their fate if they were required to return to Europe. The captain made a heroic decision to turn this ship toward the United States. The American government refused the St. Louis and, with not one country in the world willing to accept his cargo, the captain was left with no option but to return to Europe. In 1939, Britain’s “White Paper” established limits on Jewish immigration into Palestine. The nation which had made the “promise” of a Jewish homeland in Palestine limited Jewish emigration to 75,000 for the period 1940-1944. Even when confronted with concrete evidence of the horrors occurring in Eastern Europe under the SS, the British refused to allow any “unauthorized” Jewish access to Palestine. There were many instances when emigration was delayed or abandoned because the “receiving” nation required paperwork from the “departing” city or municipal government such as a stamp from the police department attesting to the lack of a criminal record. Imagine a German police department required to issue “good conduct” paperwork to a Jew! 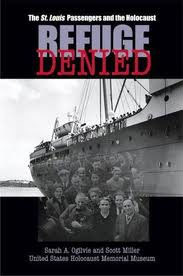 This paperwork game was played to the hilt even within the US State Department, which insisted there was no policy of rejecting Jews “as long as their paperwork is in order.” Organized bureaucratic obstruction faced Jewish refugees until, all too frequently, time ran out. The Uganda decision did not precipitate the Holocaust. Uganda was not a substitute for Palestine, nor was it intended to be. God sets the times. We cannot rush His schedule by even one day. Did Lifeboats Cause the Titanic to Sink? Before the Titanic sailed from Southampton, the ship’s designer decried the fact that not all the lifeboats had been installed. The ship’s owner, the White Star Lines, ruled against “so many” lifeboats as a waste of precious deck space. So many lifeboats, it was argued, sent a “bad message” to the passengers and the public. Who today believes the presence or absence of lifeboats caused the Titanic to sink? An iceberg sank the Titanic! In the same way, it is absurd to suggest that accepting or rejecting the offered territory of East Africa “caused” the Holocaust! Hitler and European anti-Semitism were in the pathway of Europe’s Jews on their way to Palestine, just as much as that iceberg was in the shipping lanes of the Titanic and the passengers who were bound for New York. Had the White Star Lines agreed to the installation of more lifeboats, the iceberg would still have done its damage and the Titanic would still have sunk. Many lives, however, would have been saved, though probably not all. Many more of the passengers would have reached their destination in New York. Had Herzl prevailed in securing the East African territory, it would not have prevented Hitler from coming to power nor suppressed Europe’s growing anti-Jewish sentiment. But, it could and would have saved an unknown number of Jewish lives, possibly in the millions. Palestine was destined to give birth to a Jewish homeland. Israel had to be born—in the historic land promised to Abraham, Isaac, and Jacob. The Scriptures predicted it thousands of years before. Accepting title to the East African territory could not have changed that one way or the other any more than a 2000 year Diaspora. The time was fixed. Max Nordau as a spokesman for Theodore Herzl made that clear. No one was willing to “give up” on Palestine. However, the door at that moment was shut! The timing and the mechanism—the instrument that would bring about Palestine as a Jewish homeland—was NOT spelled out. As in every instance, attempts to “force” God’s hand do not work. Herzl also made it clear. No one was “giving up” on Palestine, but at that moment the door was slammed shut! What was also clear was the emergence of an increasingly virulent strain of European anti-Semitism. THAT coupled with the open door of permission from the Czar translated into a historic opportunity. None of that would have mattered if there did not exist a destination for the Jewish masses. But here, too, an opportunity presented itself in the form of the British offer. Nordau used a Yiddish term, Nachtasyl-night shelter, to describe the Uganda offer as a mere stopover on the way to the ultimate destination of Palestine. The scriptures clearly teach us that it is not just a matter of “knowing” God’s will. Equally important to knowing His will is knowing His timing and knowing His ways—the mechanism of His choice. That would certainly have been a losing proposition. Yes, it was God’s will to deliver the city, but the general only had a portion of the message. There was also a specific how and a when! Had the Sixth Zionist Congress simply accepted the title deed to the lands of East Africa, a Jewish nation would have immediately existed. The Czar’s government was prepared to “permit,” even facilitate, the departure of millions of Jews—the same millions of Eastern European Jews who were later trapped in Nazi occupied Europe. Even a “small” Jewish nation could have granted passports, issued visas, and opened its doors. There are those who argue that the Russian Jews were “destitute” and “knew nothing” about agriculture and farming, which is what East Africa offered. The response is obvious. Would the Jews of Eastern Europe in 1906 have been “less destitute” than the survivors who arrived in Israel in 1948? Did the Russian Jews of 1906 know any less about agriculture than the ones who drained the swamps and made Palestine’s deserts bloom? Who doesn’t remember that the “free” Hebrew captives of Egypt did not enter immediately into the Promised Land? Under Moses’ leadership, the two million person Jewish nation-to-be wandered for forty years in the “wilderness.” The wilderness became a “staging area” for the new Israeli nation. Would “Uganda” have been a less suitable, more hostile, “staging area” for a Jewish nation in Palestine? How many could have been rescued if only there had been a Jewish nation? One hundred thousand? One million? Three million? Five? Let it also be noted that the offered territory had ocean access as well as rail access—even in 1906! And let us not ignore the fact that Nazi Germany NEVER penetrated beyond North Africa! The “offered” territory “just happened” to be beyond the reach of the Nazi armies under the command of General Rommel! What if a film projector could have time traveled to the Sixth Zionist Congress? What if the films of Dachau, Mauthausen, Auschwitz, and Ravensbruck could have been projected on a wall before those delegates? Would it have changed minds? There is One who knew what was coming. I choose to believe He made provision, but the offer of salvation was rejected. Who, then, is really to blame? 16 but they continually mocked the messengers of God, despised His words and scoffed at His prophets . . . The problem arises when His people do not listen to Him. When deafness strikes, we have no way of knowing His times or His ways. Then we are left to our own devices. That can prove fatal. Bein, Alex. Theodore Herzl, A Biography. Philadelphia, Pennsylvania: The Jewish Publication Society of America. © 1941. 545 pages. Judge, Edward H. Easter in Kishinev, Anatomy of a Pogrom. New York & London: New York University Press. © 1992. 186 pages. Weizmann, Chaim. Trial and Error, The Autobiography of Chaim Weizmann. New York, New York: Harper & Brothers. © 1949. 493 pages. Ogilvie, Sarah A. and Miller, Scott. Refuge Denied, The St. Louis Passengers and the Holocaust. Madison, Wisconsin: The University of Wisconsin Press. © 2006. 203 pages.